British author Martin Amis’s writing is steeped in the Soviet era. His 2002 book about Stalin, entitled Koba the Dread, was a best seller, as was the 2006 follow-up, House of Meetings, which takes place in the Gulag. Despite having written about the country for many years, Amis came to Russia for the first time in November. He spoke with Lenta.ru about his experience. Lenta.ru: You’ve written a lot about Russia, about the darkest times of Russia – the Stalin era and the Gulag. How do you feel about getting into modern Russia? 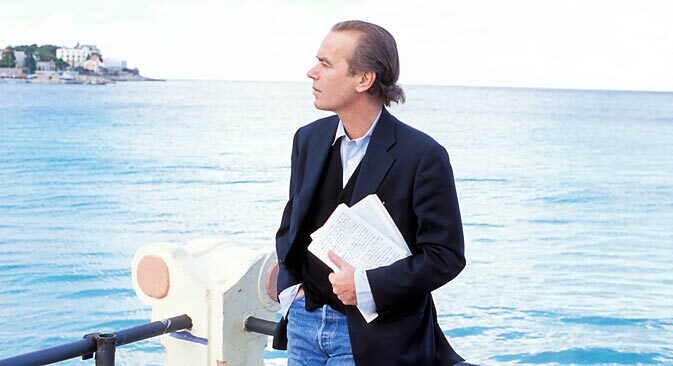 Martin Amis: It’s thrilling, exotic, strange. You feel how massive the state is. I don’t just mean how huge Russia is, but the way to the state. I certainly get a sense of how oppressive it must have been. Psychologically oppressive. Lenta.ru: Through the architecture? Through the weather? People on the streets? M.A. : Just the scale. Heavy buildings, heaviness of the state. Mussolini defined totalitarianism as “everything in the state, nothing outside the state and nothing against the state.” That’s his definition of 1925 or whenever it was. There’s a feeling I often had: Russia has never been a nation’s state. It’s been a state’s nation. No one could tell if Prussia was a country with an army or an army with a country. That’s something about Soviet Union too. Even the Russian state was a state’s nation rather than a nation’s state. Never been much worried about the citizens. Just about the glory of the state. Lenta.ru: Can you compare the Soviet Union to modern Russia? M.A. : It’s a thousand years old, this nation. It’s been well pointed out that some should have tried communism at some point and it just happened to be here, in the biggest nation on Earth. When I was in Cuba, people were saying communism was a very good idea, but it really didn’t work out. But it’s a really bad idea, and they went incredible lengths to make it work here. Just before it all collapsed, Gorbachev late at night was reading Lenin trying to find out what had gone wrong. But it was a terrible idea right from the start. Illegitimate idea. That’s why you always need terror if you are not legitimate. I feel admiration and sympathy for the Russian people, and they will endure. I had a Russian friend in Uruguay. He said it all comes down to Russia being unable to tell whether it’s an Asiatic or European culture. It’s very hard for me to imagine that. Unless your identity is threatened or messed around with, you never think about it. I never think about my identity. But I know people who [are in] exile or emigrated for various reasons. They are very concerned about their identity. You only think about it when it’s threatened or complicated. So I can’t imagine what it’s like to choose between east and west. But Russians do it. Lenta.ru: So your interest in Russian history was caused by your interest in tyranny? M.A. : This is my first time in Russia. I got into studying it because my father was a communist until 1956 when he was 34-35. And then he turned against it and substituted the ideology of communism with the ideology of anti-communism. And it became very extreme in the other direction. I thought: why does my father need an ideology? Nabokov said the world divides into people who sleep well and people who sleep badly. And he was a huge insomniac. I think another deviation is people who instinctively like the idea of revolution and people who fear them. And I’m definitely of the second kind. There are also people who need an ideology or religion and people who don’t. My father wrote about it, how bad agony it was – giving up the communist dream. The trouble with utopia is that it sounds completely hellish to live in. And in fact all the literary utopias are going back to Thomas More and Plato. It’s an analogy for the well ordered mind. We have a strong police force – in your head. You have centralized planning and all that. But what is this utopia when everyone’s a Beethoven and a Shakespeare, as Trotsky used to say. Who would want to live in the society where everyone has been able to realize their potential? Particularly if you are a novelist, as my father was. You like tension and anxiety and inequality as a novelist, not this cartoon idea of what human nature is. I know it’s a cliché to say, but all the worst things in history are done by people who think that they have a noble cause. So we should fear that. Lenta.ru: The Soviet Union was a terrible state, but people used to have certain ideals and dreams. In modern Russia we lost most of them and didn’t get far from the Soviet heritage. Do you think that we are moving in the right direction? M.A. : My ideology is the ideology of no idea. That’s the only rule you have. I’ve been hearing about religious revival since the collapse of the Soviet Union. That’s clearly one attempt to replace those values. What was ideology in the 20th century but an attempt to replace religion? God is dead, so now what? It would have seemed quite sensible if you had hindsight. When they did give up religion and just had ideology instead, it would be a milder form. It’s like a big coming of heroin (which is religion) and then having methadone – slightly more manageable. The 20th century saw barbaric things and killings which haven’t been seen in centuries. Ideology politically is much more toxic than religion. When something goes, it has to be replaced – there’s no doubt about that. Lenta.ru: The Soviet ideology came with the ideals of science, education. Now, when ideology in modern Russia is replaced with the religion, we usually see the opposite. Religious ideas contradict with the things that we consider progressive. M.A. : Religion is always reactionary. Can it come back, can it fill the vacuum – I don’t know. It’s almost disappeared in Europe. It’s still a big force in America. It’s one of the reasons why the birth rate in America is quite healthy, just above replacement levels, 2.1 children per couple. Whereas the population in Europe and Japan and elsewhere is halving every generation. They say, by 2050 80 percent of Italians will have no brother, no sister, no uncle and no cousins. When you think of traditional Italian family, hundreds of people around the table, it won’t be like that anymore. Spain is the same, France is a little better. Religion does keep up the birth rate. Everything is directed towards having children. And in Russia the death rate is overtaking the birth rate. Putin said “We’re a dying country”. What’s the projection? Lenta.ru: The battle for our demography is one of the things that Putin declares every year during his press conferences. He always claims that the birth rate is slightly increasing. But it’s hard to verify this information. M.A. : I think the average Muscovite has more chances of being killed than an Israeli living somewhere in Golan Heights. And Russian drunkenness. Centuries old emphasis of Russian drunkenness, which I’ve never seen – I’ve read about it: people drowning in the summer. They get into a river, and they’re drunk, and they die. Lenta.ru: Usual thing for our villages. So, your book about Stalin “Koba the Dread” still hasn’t been translated as far as I know. Lenta.ru: Should it be translated? What can it tell Russians? M.A. : I wouldn’t say it’s a fresh look, but it’s a look by someone who is fresh and very excited by the whole Russian revolution. I think it puts things clearly. There’s quite a lot of personal stuff that I don’t know whether it would resonate with them. I would say the Gulag novel, “House Of Meetings,” would be more appropriate. I’m not aware of any Anglo-Saxon attempt of writing a novel about that. Well, maybe one or two. It seemed like I was stepping into snow-covered field with no footmarks on it. That was exciting for me as a novelist, although very difficult to write, to get going on. Because again you feel illegitimate, you feel as if you’re trespassing. I’ve just written another novel about the Holocaust and the Third Reich. So now I’ve done two books on Third Reich, two books on Soviet Union. It’s quite a big chunk of my fiction. One day I’d like to write a third book about Nazi Germany to have trilogy. Lenta.ru: So, your new novel, “The Zone Of Interest,” is it about Auschwitz? M.A. : They [the Nazis] referred to the central bit of Auschwitz as the zone of interest, and they meant financially. One of the things that you read a lot about and you realize how much of it was making profit. And really astounding thing is that many of the Jews who went to Auschwitz paid their own fare. Usual rate: third class, one way. And free for children under 12. It’s an incredible idea to pay to go to Auschwitz. And the way they extorted money from the ghettos by Judenrats. And the dispossession of the Jews, auctions of their property, selling their businesses cheap and how they couldn’t take any money out if they got out before 1941. I think it’s the zone of interest in a deeper sense. At the end of the book there’s acknowledgements and also an essay about how the exceptionalism of the Holocaust and how no historian understands Hitler. They all say “I don’t understand him.” No one says that of Stalin. As a novelist I feel he’s not a difficult character to understand. He comes from a mountainous region and was very resentful and bore grudges. He wanted to be a dialectician. Bukharin used to say it was killing him – so badly he wanted to be a Marxist dialectician. In fact, his short course on the All-Union Communist Party is quite elusive and not intellectually stimulating at all. Bukharin was meant to be the Marxist theoretician. Lenta.ru: So when you wrote about Stalin, did you treat him like a hero of your fiction work? M.A. : Not really. I have a few near-certainties about this character that I don’t know why I feel like that. It’s just your novelist’s instinct that makes the character to add up in your mind. A fictional character will be more coherent than a historical one. Because life is less coherent than fiction. The difference between life and fiction can be told in this way: compare a woman’s elegant shoe with a very narrow tall heel to your foot. Fiction is the shoe, life is the foot. You can see how contrived and stylized the woman’s shoe is. Nothing like a foot. It’s a mistake to contribute too much coherence to a historical character. There’s nothing that really troubles me about reading Stalin as a character. You know, he is eventual and ruthless, but he is recognizable in a way that Hitler is not. Hitler is a black hole. There’s a brilliant and true remark I came across a while ago. Another good reason for calling the book “The Zone Of Interest.” A Jewish-American writer, novelist and critic not long ago said that how we feel about the Nazi genocide is essential to our self-understanding. I think that’s profoundly true. And no other historical episode does that. You feel that you’re finding out something about yourself and the society in general. It’s the worst [thing] we’ve done so far. In the best educated state in the world – Germany – we saw such a fantastic disgrace. I don’t think that’s supernatural, but it’s because I don’t believe in the supernatural. And there’s a lot of argument about radical evil, and it’s a common example. But how they [the Nazis] carried the German people with them – that’s another huge mystery. Editor’s note: This article has originally been published in Russian on Lenta.ru. Kirill Golovastikov gave RBTH the original recording of his talk with Martin Amis which took place in English.